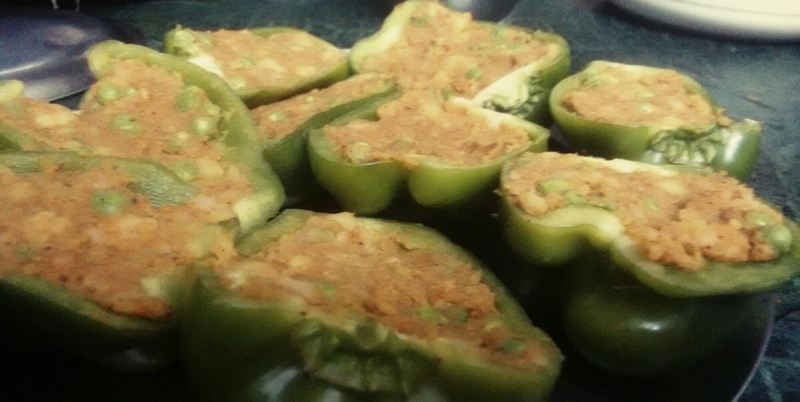 Stuffed capsicum( bell peppers) is a main course dish that can be easily prepared by the most inexperienced cooks. 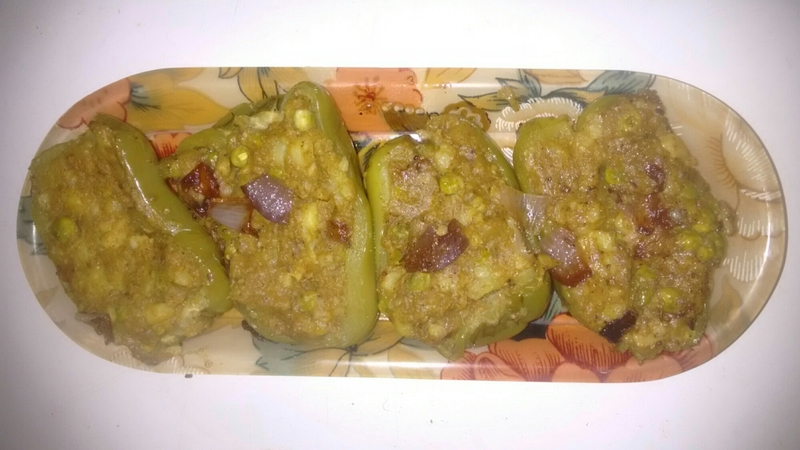 I will teach you how to make stuffed capsicum Indian style( Bharwa ShimlaMirch). This is an easy and delicious recipe and you must try it. 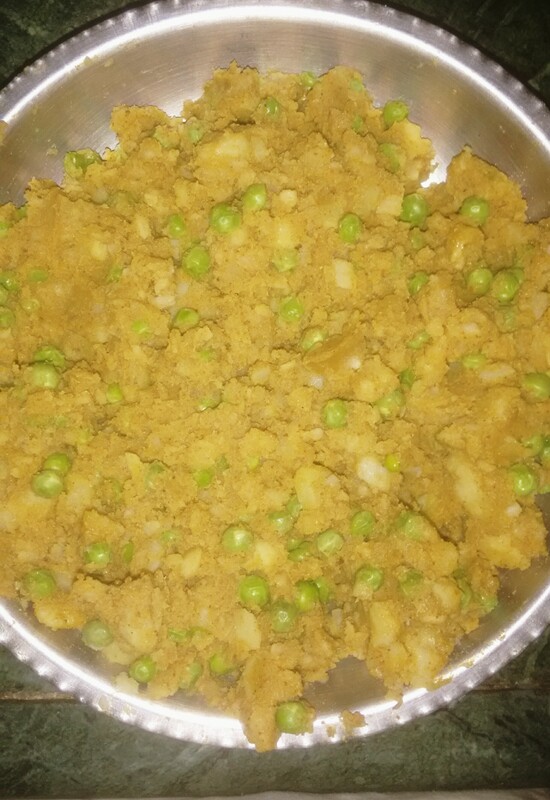 – mash the boiled potatoes and peas. – Add in all the powdered ingredients and juice of half a lime and mix everything together. – The filling is ready keep it aside. 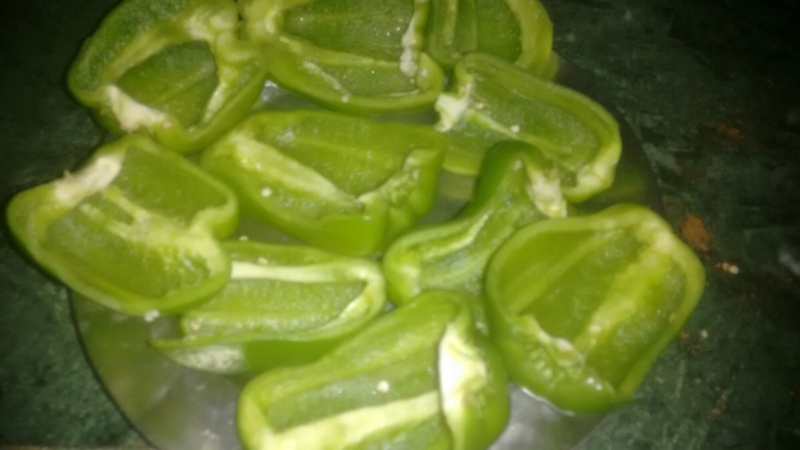 – Wash the capsicum properly before slicing them in half. – Remove the seeds and core of the capsicum to prepare a cavity for the stuffing. 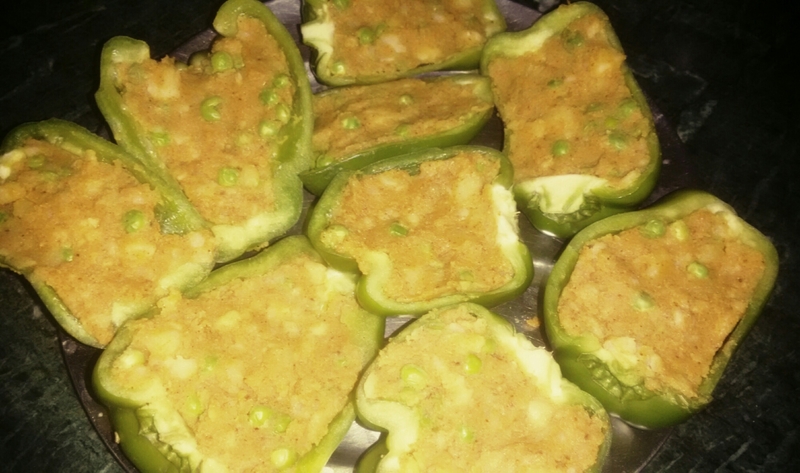 – Fill the capsicum with the stuffing properly. – Cut the onions into cubes. – heat the oil in a pan. – Once the oil in hot throw in the onions and sauté them till they are soft. – Once the onions turn translucent remove them from the pan. 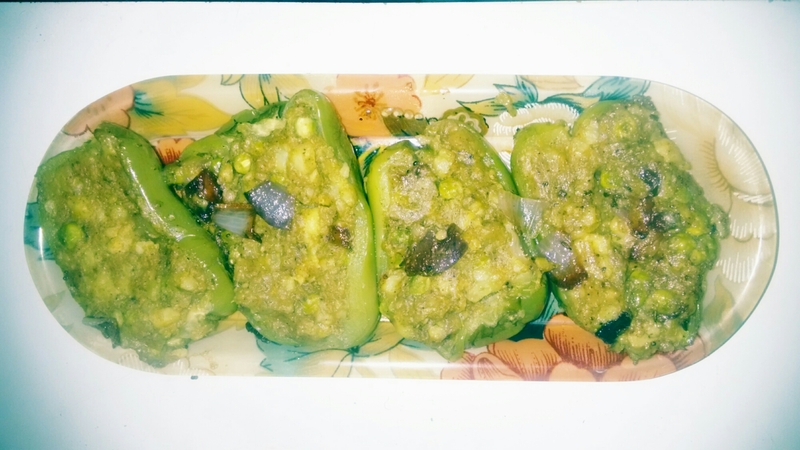 – In the same pan carefully place the stuffed capsicum. Place the green shell of the capsicum facing downwards so that you don’t spill the filling. – cover the pan with a lid and let it cook on low flame for 5 minutes. – After 5 minutes remove the lid and throw in the cooked onions on the top of the capsicum. – Cover and let it cook for another 10 minutes. -After 10 minutes the capsicum must have cooked. Check the capsicum. If the capsicum is soft on touch it is cooked. – Remove from flame and serve hot. – This preparation can be eaten with Indian flat bread( roti or paratha) or it can be eaten separately as a main course dish. 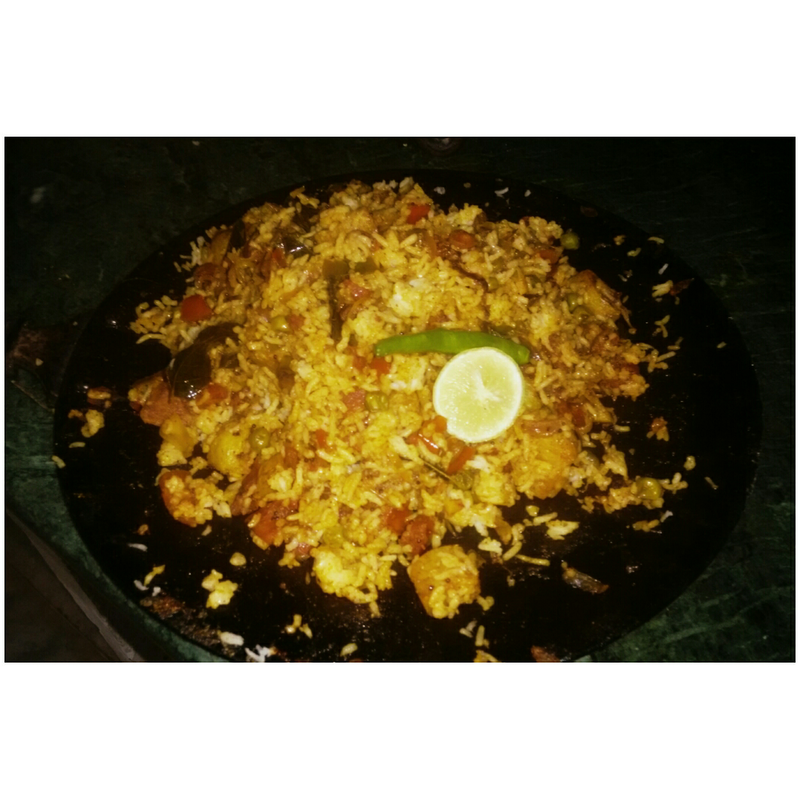 Please leave a comment if you do try my recipie and like it!! 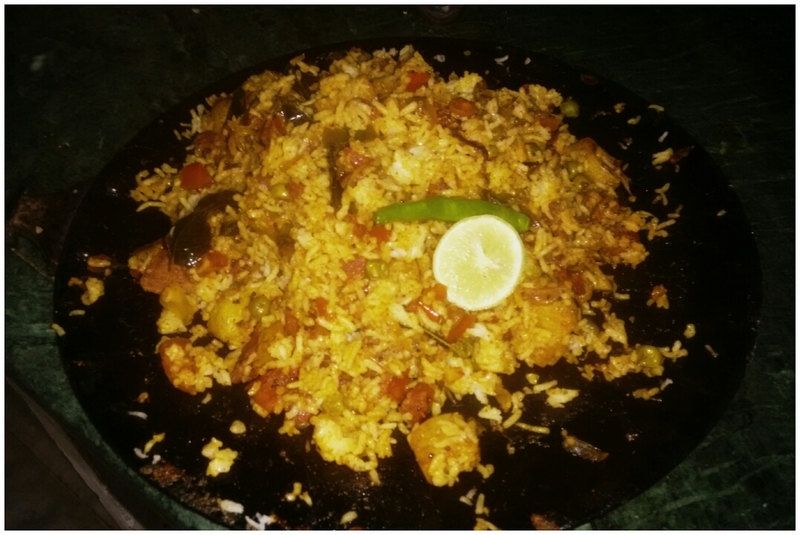 Tava pullav is an Indian rice dish which is prepared on a flat top cast iron top pan. The cast iron pan holds its importance in Indian culture and cuisine. The rice dish is full of spices as India is a land of spices. The cast iron pan provides extra flavour and nutrition to the dish. This is a perfect way to use up your leftover boiled rice. The flavours in this dish are amazing and a balance of spicy, tangy, sweet and sour. – peal the boiled potato and cut it in cubes. Now just shallow fry the potato to make them slightly crisp. – Heat up a cast iron flat top pan ( tava) on medium flame. When the pan is hot throw in the mustard seeds. 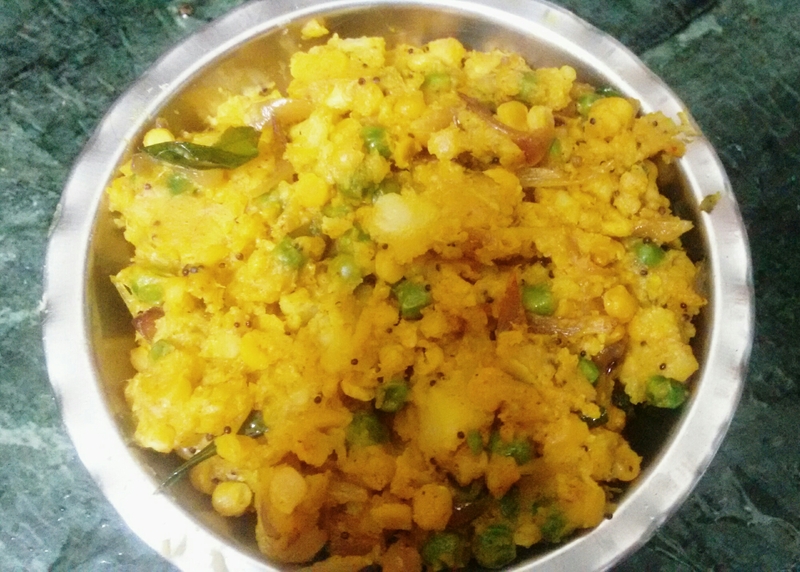 – Once the mustard seeds start spluttering add the curry leaves, ginger and garlic. Sauté for 2 minutes. 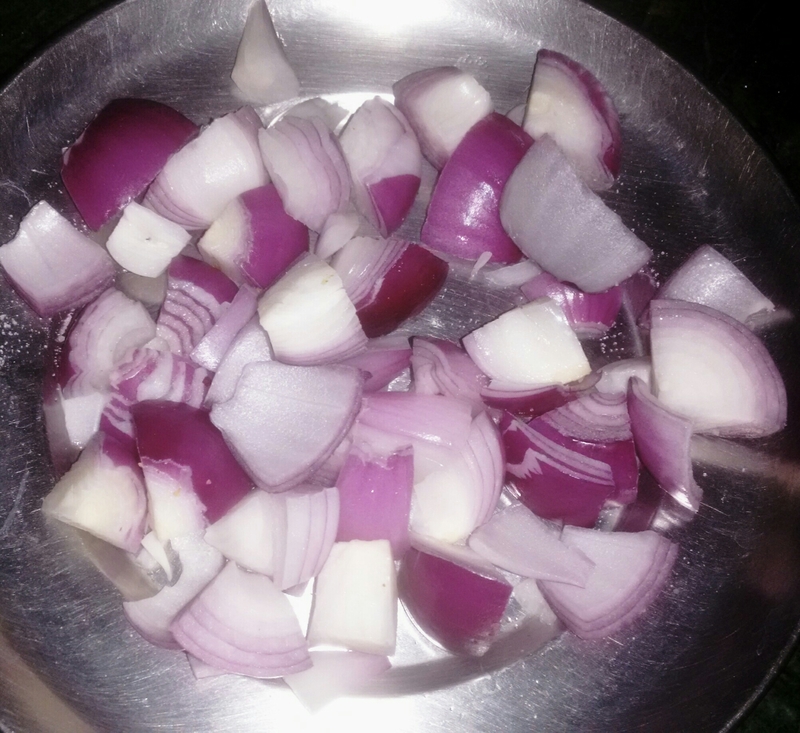 – After 2 minutes add in the finely chopped green chillies and onions. Sauté till the onions turn translucent. – Once the onions are translucent add in the sliced carrot. Let the carrots cook till they soften. 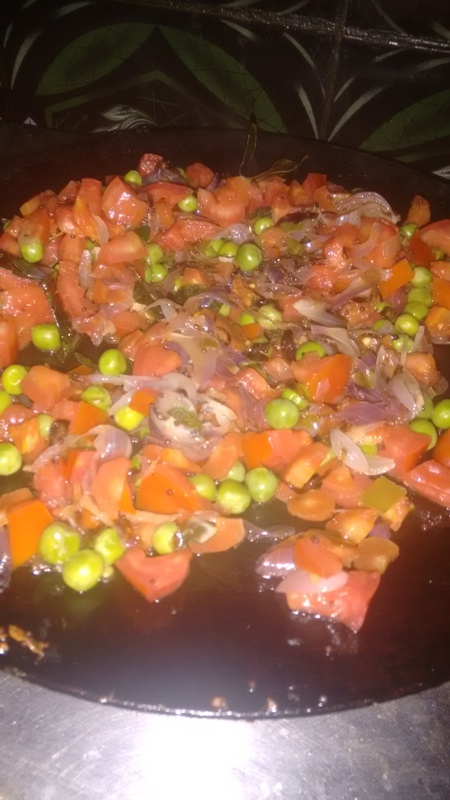 – Once the carrots start softening add in the boiled peas and finely chopped tomatoes. – Sauté till the tomatoes loose most of their water. – Once the tomatoes are cooked mix in the dry spices- salt, turmeric powder, red chilli powder, coriander powder and paav bhaji masala. Also add in 2 tbsp water as the water makes it easier for us to mix all the spices with the vegetables. – sauté for 2 minutes on low flame. – After 2 minutes add in the shallow fried potatoes and the boiled rice. – Using 2 forks gently mix all the spiced vegetables with the rice till they are combined. – top it up with some cilantro and give the rice a final mix. This rice preparation tastes fabulous with plain yogurt or Raita. These are the most tempting and delicious delights. They are the best teatime snacks and have an extremely high nutritious value. Yogurt is an amazing source of calcium and phosphorus. These sandwiches make up a very low calorific meal. Making them is as mush fun as eating them. – Put the yogurt in a muslin cloth and let it hang overnight. This will drain out all the water from the Curd. – In the morning remove the hung Curd from the muslin cloth and place it in a mixing bowl. 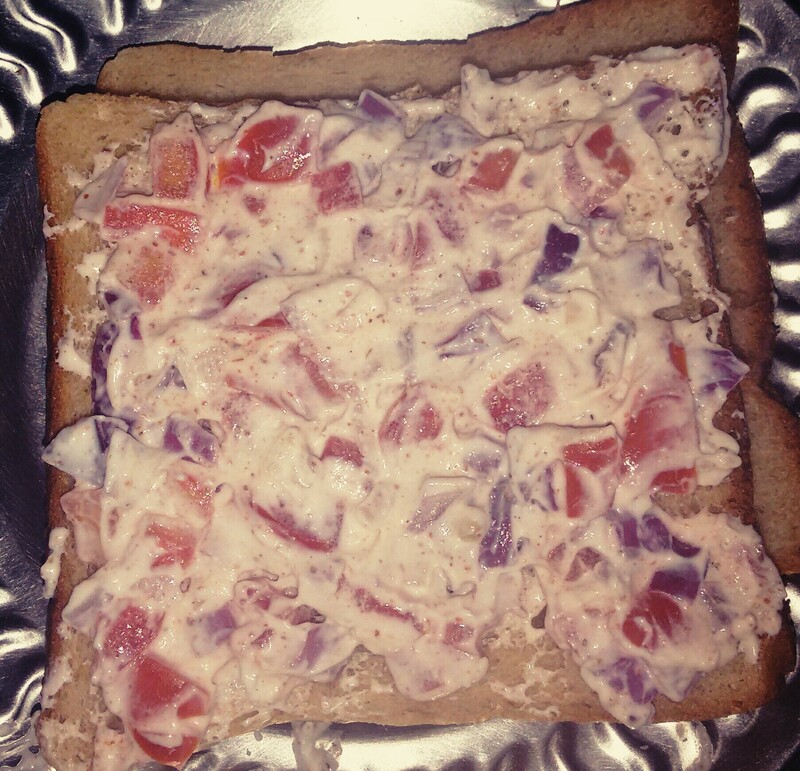 – Mix the chopped onion and tomato in the Curd. – Add the paprika powder and the salt into the Curd mixture. 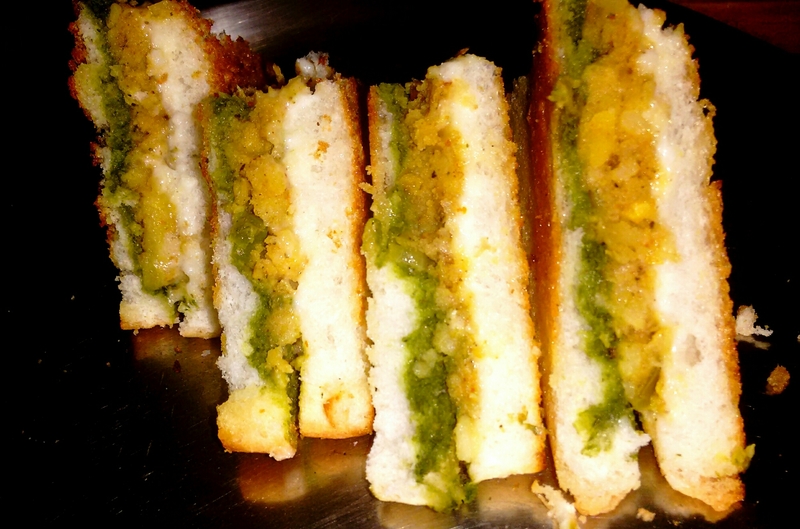 – Apply an even layer of the Curd spread in between 2 bread slices. – Heat some butter in a pan. When the pan gets hot scatter in a pinch of mustard seeds. – Once the seeds start spluttering ,place in the sandwich and let it cook for a minute. 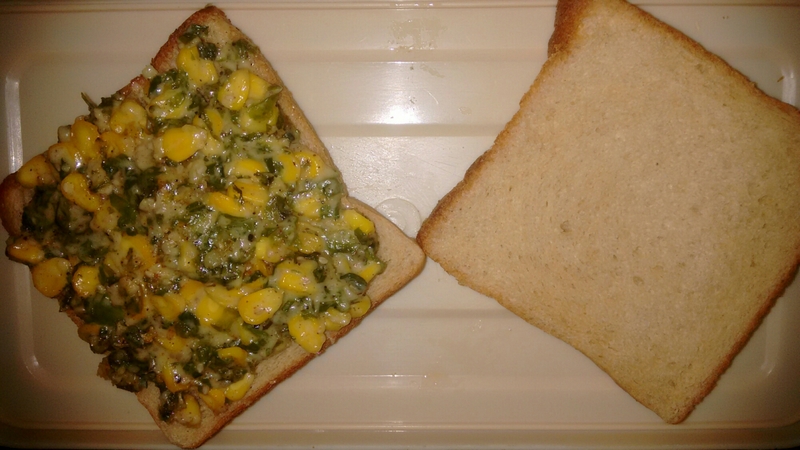 – After a minute flip the sandwich and let it toast from the other sides. – once both the sides of the sandwich are toasted enough, take them out of the pan and enjoy with ketchup or pesto sauce. There can be nothing better than this recipie as its the best way to feed the iron rich spinach and the vitamin B complex rich corn to all those people who squint at the mention of vegetables. It is a very healthy recipe and extremely beneficial for all age groups. This recipie is made in 2 simple steps 1) making the corn and spinach filling 2) preparing the white sause. 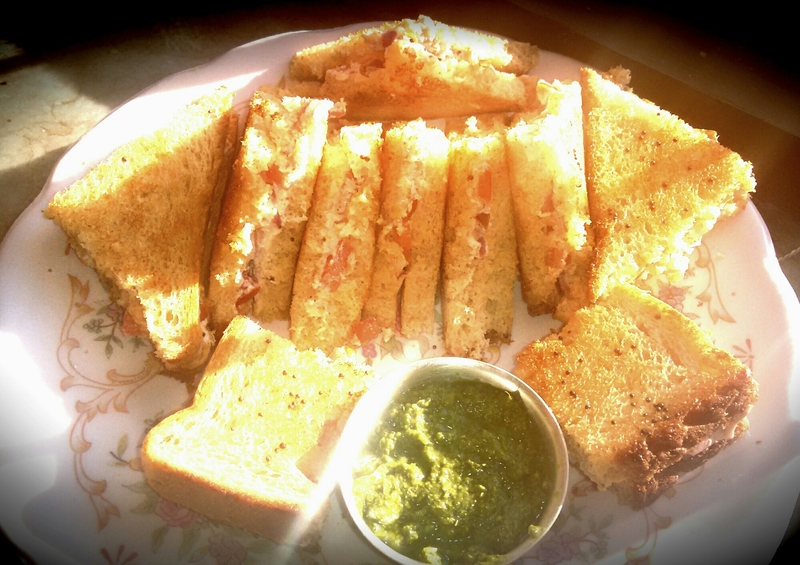 So get ready to cook and enjoy these healthy and yummy sandwiches. – heat the oil in a pan and and boiled corn to it. Saute for 2 minutes. – Add in the finally chopped spinach. Let it cook for 5 minutes. – After the spinach gets cooked add little bit of salt and nutmeg powder. Don’t be very heavy handed with the salt as the spinach leaves are naturally salty. – mix in the chili powder and the sesame seeds. Let it all cook for 2 minutes on low flame. – remove the prepared filling from the pan and place it in a mixing bowl. – To make the white sauce, to the same pan add the butter and the all purpose flour. – after mixing it for 2 minutes on low flame stir in cold milk making sure that no lumps are formed. – Once the sause starts thickening mix salt and pepper to it and remove from flame. – mix the sause with the corn and spinach filling. Add in the shredded cheese as well. – your filling is ready to be placed on the bread. – Apply a good layer of the filling on a bread slice and cover it up with another bread slice. 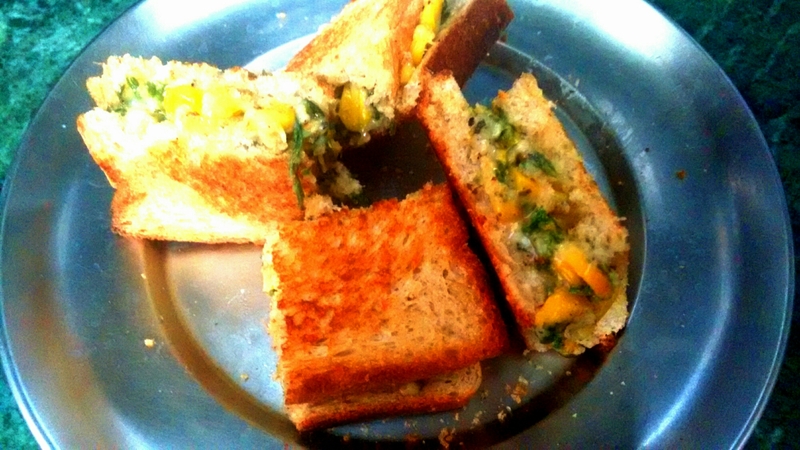 – Apply butter on the bread slices and grill the sandwiches on a pan or you can also toast them in a sandwich maker. 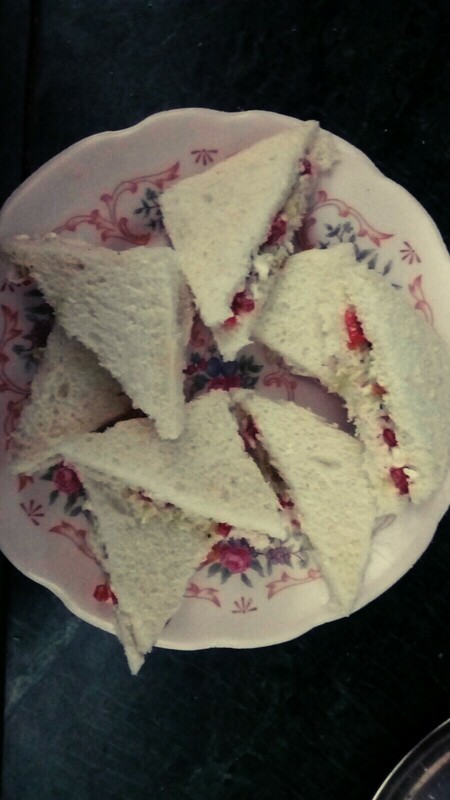 – cut the sandwich in desired shapes and sizes and serve hot with ketchup. 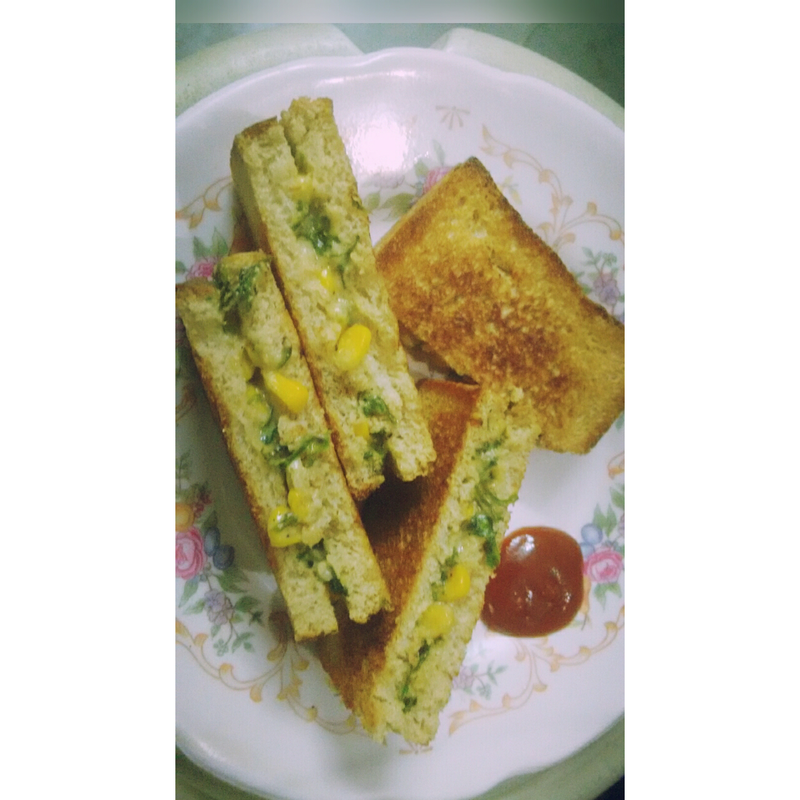 My 3 layered chilli and cheese grilled sandwiches with potato filling are the go to recipie if you want a blast of flavour in your mouth. Children love them as the chilli is not that empowering and cheese is every kids delight. Just like my other recipies this too is very simple and ever after a little work they taste delicious. 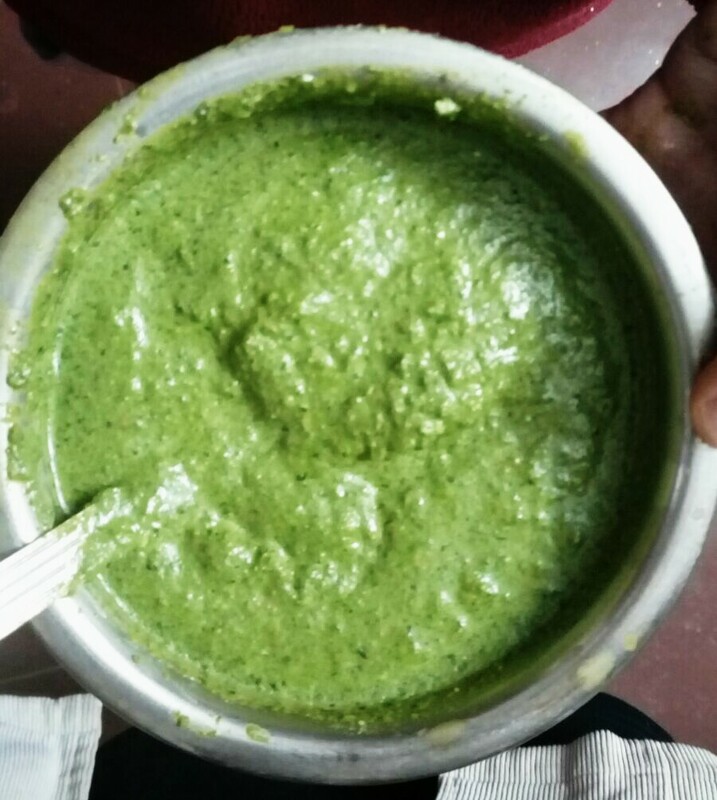 -put all the ingredients of the chutney recipie into a blender and blend it all up into a thick paste. – Heat butter in a pan and wait it to heat up. – throw in the fennel seeds and the curry leaves. – Saute till the onions are golden brown. Once the onions turn golden brown add in the finally chopped tomatoes. – sprinkle in the salt and turmeric powder, saute till the tomato softens. 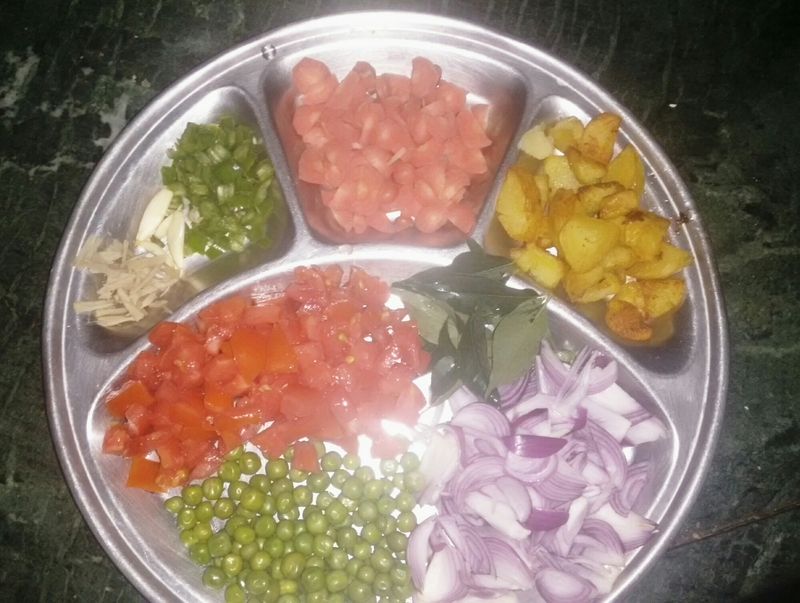 – Mash the boiled potato and mix with the cooked tomatoes,peas and onions. – Mix the oregano, red chilli flakes and some crushed pepper. – Remove from the flame and mix in juice of half a lime. Keep aside. -Take 2 slices of bread for a sandwich. 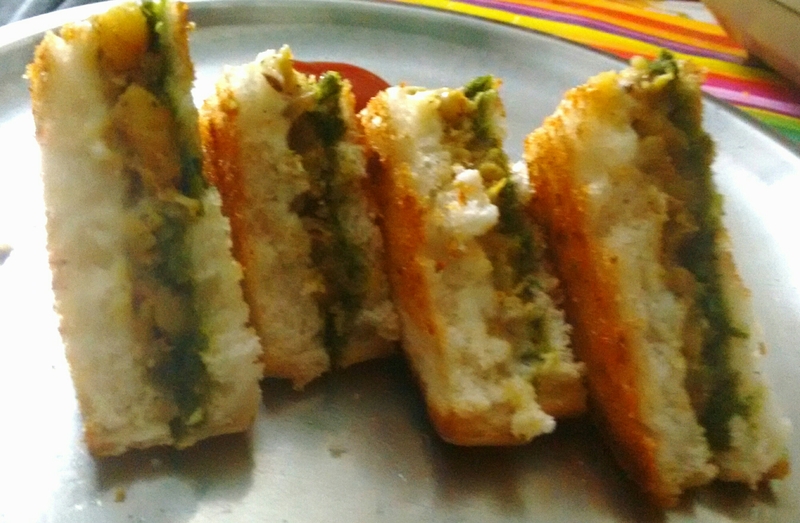 – Spread a layer of chilli chutney on a slice of bread. 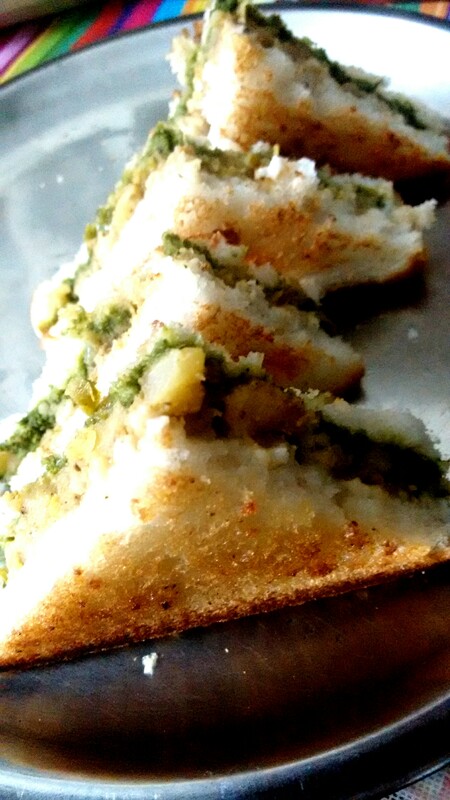 – spread a generous layer of potato filling on top of the green chilli chutney layer. – put the slice of cheese on top of the potato filling and cover it all up with the other slice of bread. – Butter the breads properly and grill them till they are golden brown. – serve the sandwiches hot with ketchup. 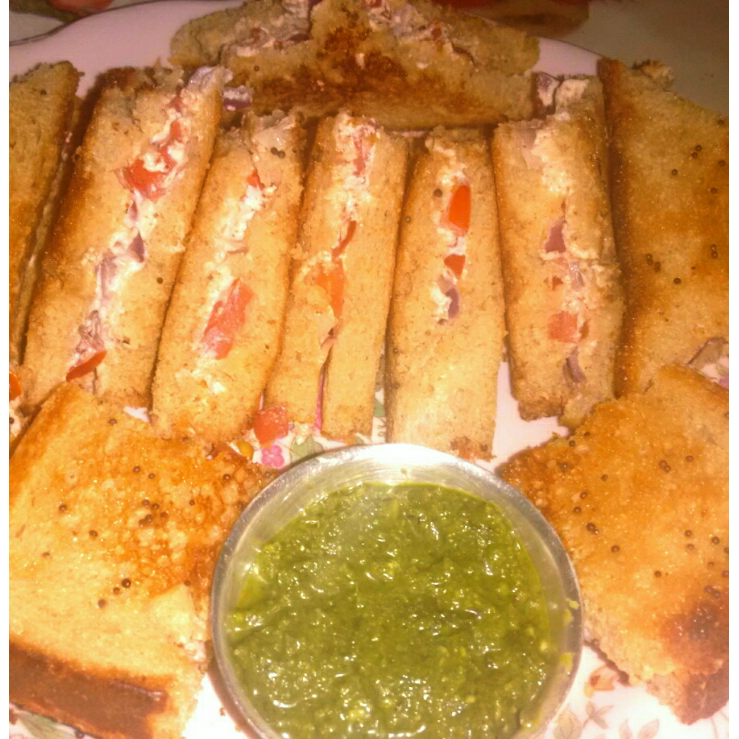 My cucumber, tomato and cheese sandwich recipie is super simple and the sandwiches are to die for. Here is the recipie for my cool and amazing sandwiches. – Remove the seeds of the cucumber and grate it. – Remove the seeds of the tomato and finely chop it. 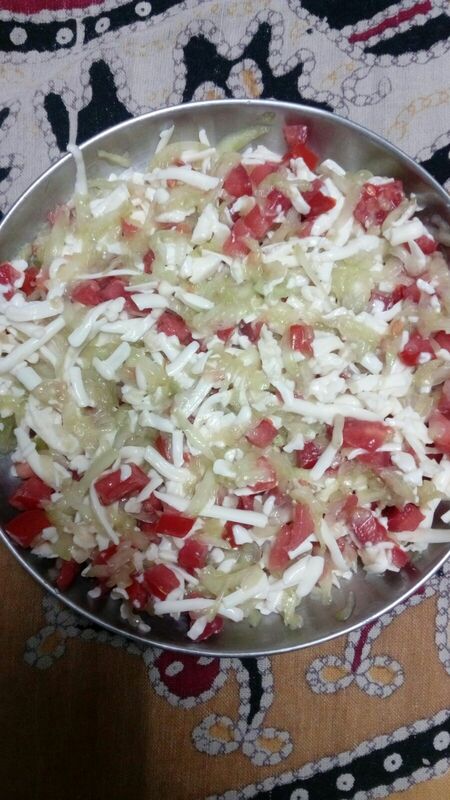 – Mix the cucumber, tomato and cheese in a bowl and mix them all up. – Mix some salt and pepper with the vegetables and cheese. – If you wish for extra flavour add some chilli flakes and Italian herbs as well. 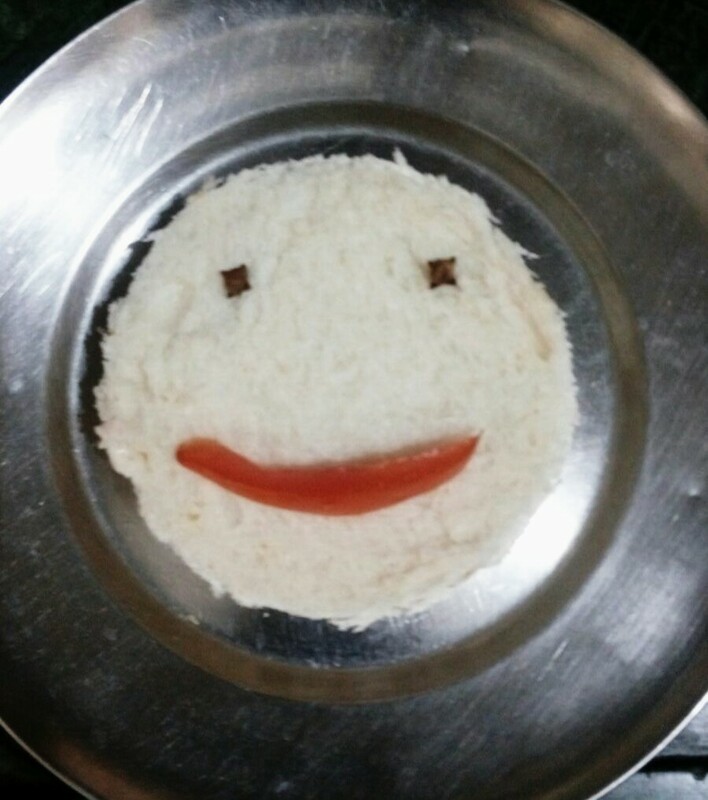 The sandwich filling is ready!!! -Take two slices of bread, remove their sides and butter the slices well. – Apply the sandwich filling generously in between the slices. 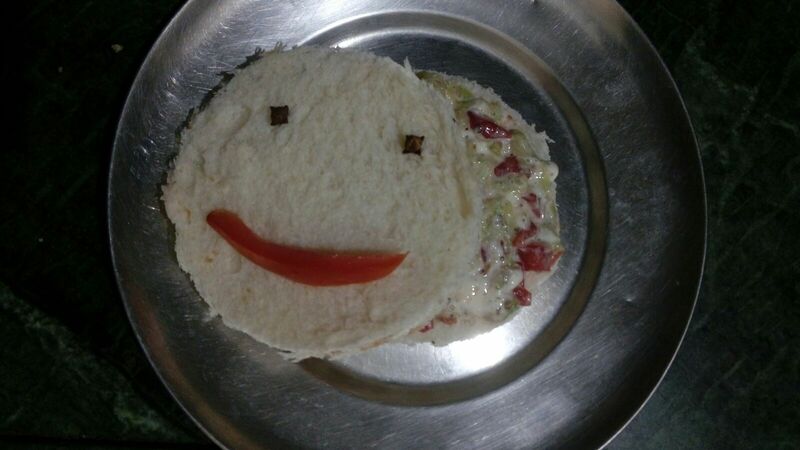 – Cut and decorate the sandwiches as per your wish and creativity. – Enjoy your sandwiches. They are perfect tea snack and healthy for kids.